Overheating is dangerous and can severely limit the activities that our dismounted troops can carry out. Our Defence personnel are often already lugging around extra weight in the form of body armour, uniforms and equipment in stressful, dangerous, inhospitable environments, so a system that would help control body temperature to reduce heat stress would be a welcome development. DST scientists are developing a personal cooling system that uses heat pipes to rapidly and efficiently move heat from a human torso to a cooling device. "Cooling to maintain core body temperature for soldiers is a critical issue that affects duration, performance and health," says Dr Ahmed Bhoyro. He admits that the challenge is not new, and there are already many cooling systems that have been developed and sold commercially. 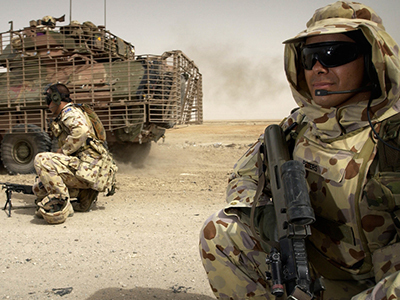 However existing systems tend to require power, may generate noise, are usually heavy and bulky and do not integrate effectively with the Australian soldier combat ensemble and equipment. The challenge accepted by Dr Bhoyro and colleagues was to develop a system that provided significant cooling without the shortcomings associated with current commercial systems. Their design does not require any power, weighs less than one kilogram and has a vest that is only 5 mm thick. Dr Bhoyro evaluated several possible designs, in collaboration with CSIRO counterparts, before deciding that metabolic cooling using heat pipes was worthy of supporting. Although this has been a collaborative effort, Dr Bhoyro acknowledges that much of the work and design of the concepts has arisen from the expertise of CSIRO scientists Tony Pierlot and Ron Denning. The heat pipe system consists of two sections: the vest where heat is drawn out of the soldier's body, and an exchanger section where the heat is released to the environment. Heat is drawn out of the soldier's body via evaporation of a working fluid which is kept under a vacuum in the vest. After releasing its latent heat via the exchanger system, the condensed working fluid is then wicked back to the areas over the soldier's body to repeat the cycle. Many Defence groups have been consulted during the development of this concept, enabled the scientists to understand the typical environment, requirements and limitations when using a cooling vest (or indeed a heating vest for Navy diver; the heat pipe concept affords the potential to heat as well as cool). The next stage of research is to develop a prototype cooling system that can be tested using DST's thermal manikin and compared to commercially available systems. Manikin trials of a stand-alone system is scheduled for later this year. The metabolic cooling vest is one of several initiatives being researched within DST's Future Soldier program. Further information is available in a short video developed for Land Forces Conference which can be found on the DST YouTube channel.